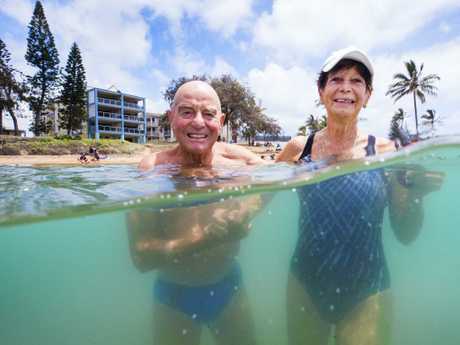 SLEEPY coastal settlements, a secret paradise on the edge of the Great Barrier Reef and even a thriving mining services city, have been revealed as the surprise top beachside spots to retire in Queensland. In landmark research for the Sunday Mail, The Demographics Group examined the Sunshine State's 400-plus towns to identify locations which provided the best mix of cost of living, services and lifestyle for retirees. Director of Research Simon Kuestenmacher said the research, which also uncovered the top tree-change locations to be revealed in the Sunday Mail next week, was fascinating and said that it smashed conventional wisdom. "There are unexpected results for sure,'' he said. 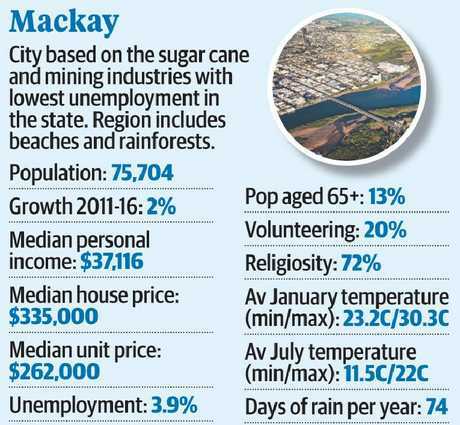 Not least is the inclusion of Mackay among the top five sea-change spots. 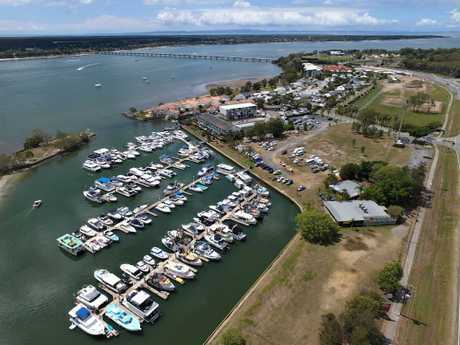 The northern city, better known as a sugar-growing and mining services centre, makes the list, along with Bowen - the state's mango capital - and more traditional locations such as Bargara near Bundaberg, Yeppoon outside Rockhampton and Sandstone Point near Bribie Island, 90 minutes north of Brisbane. "According to our data analysis, these are the five coastal towns with the ideal demographic profile for retirement," Mr Kuestenmacher said. "Of course, no one picks a location to retire based just on data points, but it's a good indicator that these places have the characteristics and features which appeal to retirees." Sandstone Point and the gateway to Bribie Island. It also "absolutely'' presented an opportunity for those towns to market and promote themselves as retirement destinations. "Because all those towns would be happy to receive a bit of population growth. Attracting more retirees means more retail spending, more money in the local economy, more opportunity for jobs,'' he said. The Sunshine State remains a prime destination for people seeking a new life once their working years end. Almost one in 20 retirees have moved here from another state in the past five years. That's about double the proportion in Victoria and nearly five times the rate in New South Wales. "Queensland is a very attractive location," said Mr Kuestenmacher. "First and foremost, there is the climate. It's something that's hard for the southern states in Australia to compete with. "You could also argue the lifestyle advantages that people seek out in terms of this being a more comfortably-paced environment. And, of course, you have beautiful beach locations. "It's the idea of finally buying that tinnie and going out more often on the water and just doing the things that you always wanted to do. 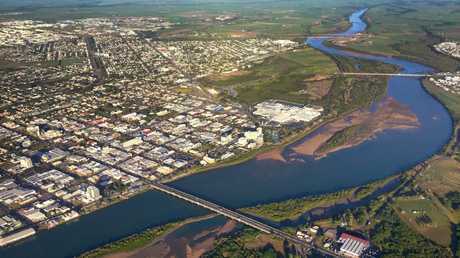 An aerial photograph of Mackay. ''And especially doing them fairly early on in your retirement. Because if you retire at 65, 66 whatever it is, you still have 20 years to live and you probably have at least 10 in very good health so you might as well be in an environment that allows you to do the things that you want to do," he said. ''Australia's population has gravitated to large state capital cities for employment opportunities. My conclusion is that we have tons of people living within capital cities who don't want to live in capital cities. And as soon as they are freed from their shackles of work, they move to lifestyle towns." 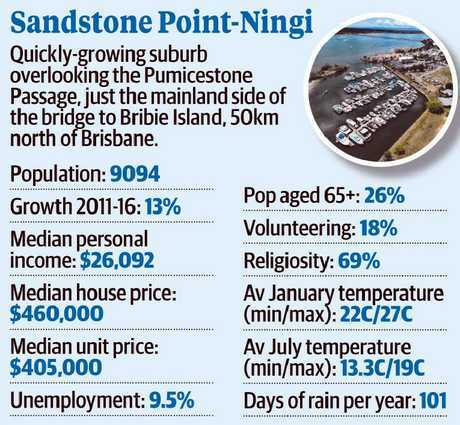 Sandstone Point's proximity to Brisbane helps with its appeal. As the most decentralised state, Queensland offered a plethora of choices. It also has a strong housing affordability advantage. "House prices in Sydney and Melbourne are significantly higher than they are even in the heart of Brisbane," Mr Kuestenmacher said. "So, as a retiree, when I'm finished with my work and the kids are out of the house, why not sell my $1 million house in Sydney and buy the equal house for $600,000 or $700,000 in Brisbane and then have $300,000 to put in my investments. Or buy a home for under $400,000 in one of these locations and have even more money in the bank." 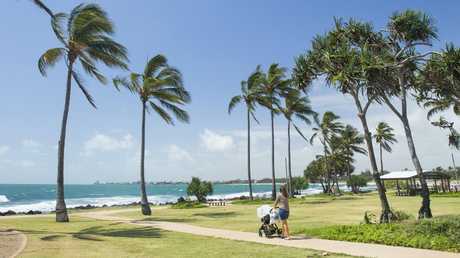 Bargara is a relaxed coastal settlement near Bundaberg. Mackay Deputy Mayor Amanda Camm welcomed the city's inclusion. "We've been trying to change our reputation for a few years, so this is great news." 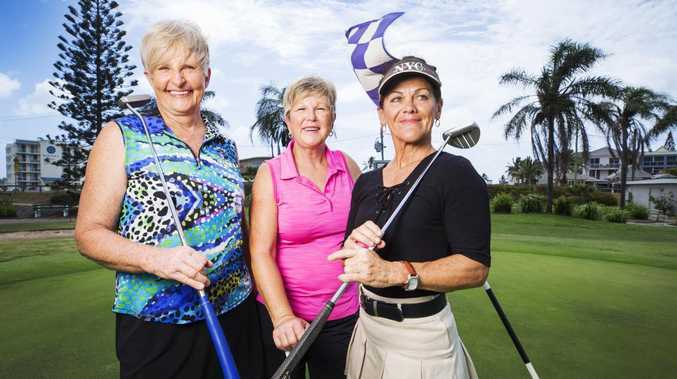 The regional council had organised roadshows for journalists from seniors' magazines to extol the area's attractions and it was working, with increasing numbers of Baby Boomers relocating from Sydney and southeast Queensland. "There are also people who have travelled through this region as grey nomads and liked it so much, they have come back to live." Mackay was a surprise inclusion to the list. increasingly important destination in its own right," Cr Camm said. mining town. We have a pristine environment. "Without a doubt, the climate is a big plus. We're in the subtropical zone." 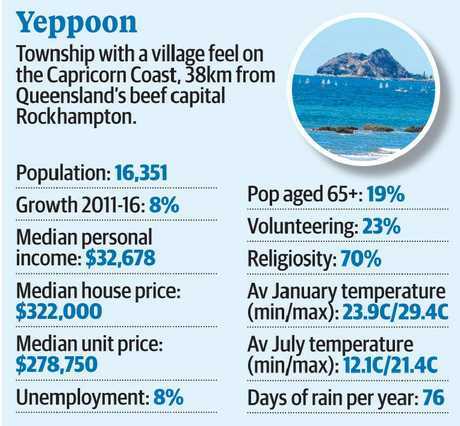 Retirees love Yeppoon’s seaside village appeal. A lively cultural scene was an attraction. "We have an amazing art gallery of national standard and the Entertainment and Cultural Centre gets great shows. "We have walkways and cycleways. There is no traffic, so everything is only 20 minutes away." 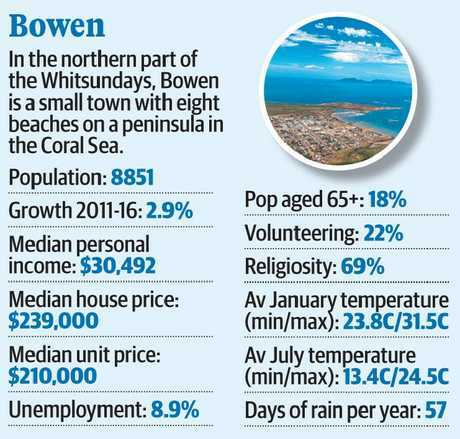 Bowen rated highly among retirees. There was plenty of opportunity for part-time work in the health and social services area as well as education, with campuses of James Cook and Central Queensland universities. treatment, were now available locally. With beachfront properties on the market from $700,000, it was very affordable for people shifting from Sydney. 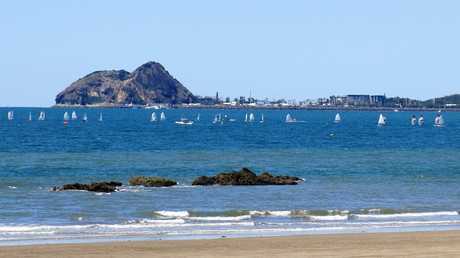 IT'S known as the "Goldilocks region", the seaside strip where it's not too cold and not too hot and where everything is just right. 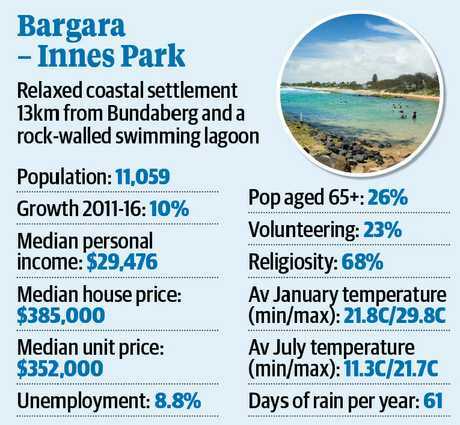 Bargara, a 15-minute drive from Bundaberg through cane fields to the coast, is one of the top five retirement destinations in Queensland, according to analysis by The Demographics Group. And residents say the numbers are spot on. "It's a hidden secret," Kaye Nicholls, 62, who moved to Bargara with husband Bob, 67, after visiting family in the area. She and Bob have a beachside unit across the road from the golf club and play nearly every day of the week. 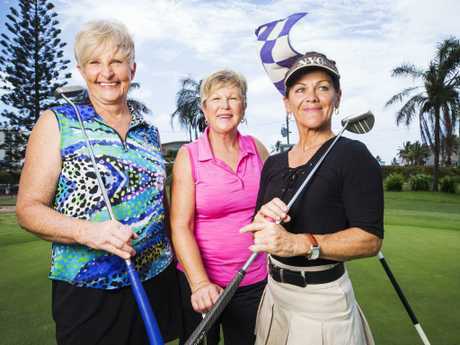 Club president Janine Smith, 66, said Bargara had everything she needed while fellow club member Allison Jackson, 58, said she and husband Rory couldn't be beaten. Markus, 81, and Jannette Widmer, 83, moved from the Sunshine Coast 18 months ago, drawn to the laid-back lifestyle and waterfront. "Where we live is wonderful," Mr Widmer said. Mayor Jack Dempsey said Bargara was a hidden jewel. 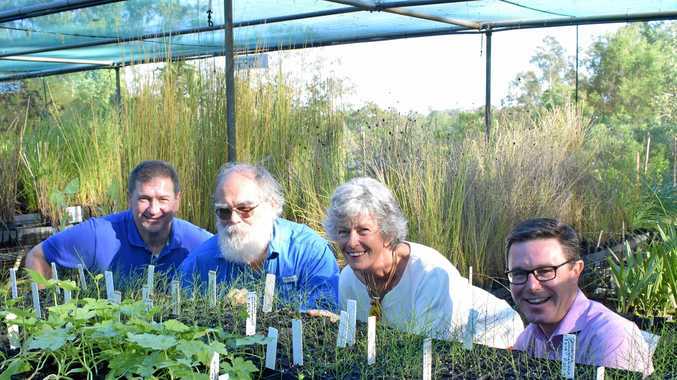 "It's Australia's best-kept secret," Mr Dempsey, head of the Bundaberg Regional Council, said. "We call ourselves the Goldilocks region. It's not too big and not too small. Same with the weather - it's never too hot or too cold. "It's one of the top five climates in the world. The sea breezes mean you don't even need airconditioning." The beaches and walkways are an attraction as well as the character of the town. "It's quintessentially Australian. There's the surf lifesaving club, great coffee shops, butchers and bakers," he said. "The locals say you live an extra 10 years here." But just in case, there are two private hospitals and a public one a short drive away in Bundaberg. Houses still under $400,000 are luring lots of retirees, including those from interstate. THE Demographics Group looked at the 418 unique towns identified by the Australian Bureau of Statistics as urban centres in the 2016 Census to make a final list of top retirement destinations. "As a retiree, you want to live in a town that isn't too big," director of research Simon Kuestenmacher said. "But you also don't want it to be so small that it doesn't have an IGA or basic amenities. "We came up with an ideal retirement town size of 2000 to 500,000 residents." That excluded Brisbane and the Gold Coast and cut the list from 418 to 103. "You don't want to be the only oldie, but nor do you want somewhere where everyone is retired so we looked at places where 10-30 per cent of the population is aged 65-plus," Mr Kuestenmacher said. That narrowed it to 70 locations. 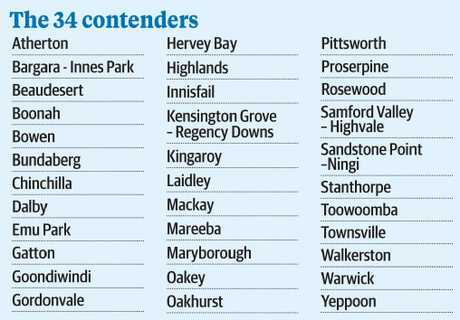 The 34 final contenders for Queensland's best place to retire. Cutting out "dying" towns with a shrinking population cut the list to 55, and the researchers then removed places with religious affiliation below the national average of 66 per cent, figuring ageing people tend to turn or return to faith. "We also wanted to make sure these towns have a sense of community. The best way to estimate the level of social cohesion in a town is to measure the number of people who volunteer." The researchers included locations where at least 15 per cent of the population volunteers. That left a list of 34 contenders for the best retirement towns, which were then divided into sea-change and tree change, destinations. Importantly, the five top sea-change retirement locations also had hospitals in the town or, in the case of Bargara and Sandstone Point, within a short drive.